We all do it. Fuss. Bicker. Squabble. And we usually do it with the people we supposedly love the most. These are the fights that feel almost scripted because both people say the same things over and over. You can predict how long it’s going to last, and then who does what when it’s over. You might clams up for the entire day, continuing to perfect the silent treatment routine. Or you might complain to your best friend (or worse, your mother). These fights don’t get physically violent, but they still hurt tremendously. Like food that was left out too long, this type of bickering spoils what started out as a good day. 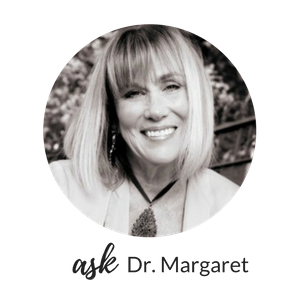 You are left feeling like your relationship is stuck and stagnant. As a therapist, I hear, “We can’t communicate.” There are common squabbles with recurring themes underneath the fighting. Sound familiar? What is this about? Feeling gratitude for what you do, and affirmation that you’re appreciated. There is a lack of recognition for what each of you contributes, and cooperation is missing when one of you gets tired or overwhelmed. This is especially true for family chores that are repetitive and seemingly never-ending such as weeding the lawn, cooking, or doing the laundry. What are you really fighting about? 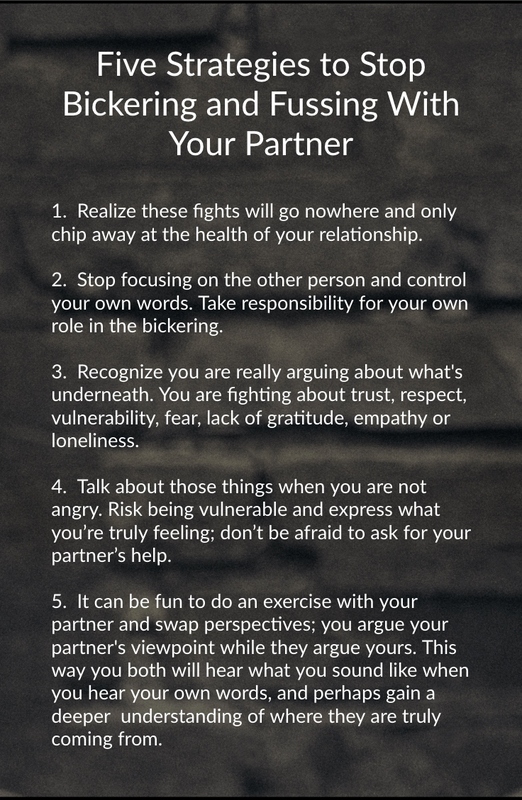 In these fights, effort needs to be made in moving beyond hurt feelings for past grievances so that trust can be rebuilt in your relationship. This may mean addressing your own prior actions and expressing remorse to those you’ve hurt, whether intentionally or not. Or perhaps your struggle is to move past the resentments you’ve accumulated and held onto over years that keep you angry and unable to forgive. This is judgement, or even ridicule. Dr. John Gottman, in his excellent research on couples, tells us that contempt is the number one communication quality that kills a relationship. Honoring the differences between you, and acknowledging each other’s strengths, is vital. Recognize you each bring something special and important to the relationship, and that this can help each of you grow as individuals. The first statement is another example of contempt, mixed in with some utter discounting of your partner’s perceptions. Bringing in the kids, or parents, or friends, as your “witnesses?” That’s a bad idea all around, unless you are doing a true intervention of some kind, because it could potentially taint their relationship with your spouse…or with you. Several things can be underneath a desire to always be right. It could be a need to feel superior, which really is and attempt to hide insecurity. Perhaps it is defensiveness that is covering up hurt, or perfectionism that is out of control. It is also possible that there is anger about other things that are not being discussed, but are in the background causing resentment that needs an outlet. This particular fight? It is lonely to win and even lonelier to lose. 5. The It-Sounds-Like-I Am-Talking-About-Me-But-I’m-Really-Blaming-You Fight. I learned recently from my friend Dr. Dina Hijazi that this is what’s termed “the U-Turn” by famous therapist Pia Mellody. It sounds like this. It sounds like, on the surface at least, that you are talking about you. But you’re not. You are angrily telling the other person what you are telling yourself about them. You are blaming them for how you feel. Blame is easy. 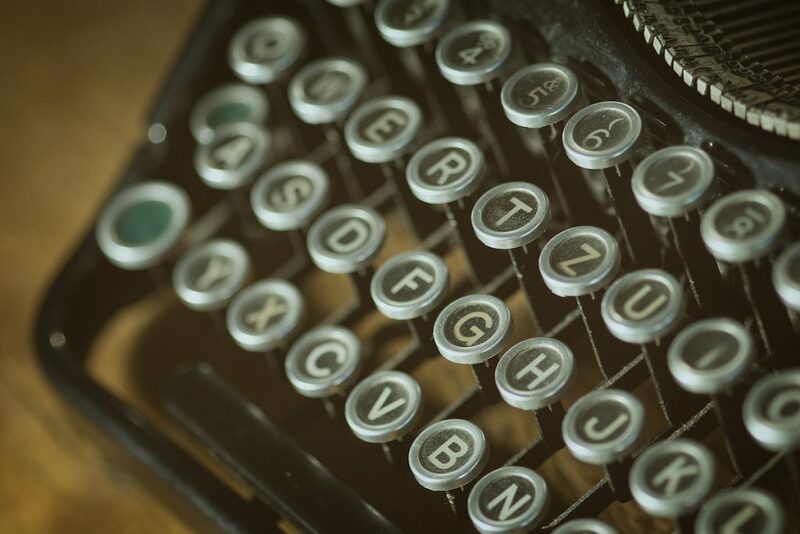 The second is much, much more vulnerable – and thus, more difficult. So what do you do if you frequently have one of these types of bickering fights with your partner? 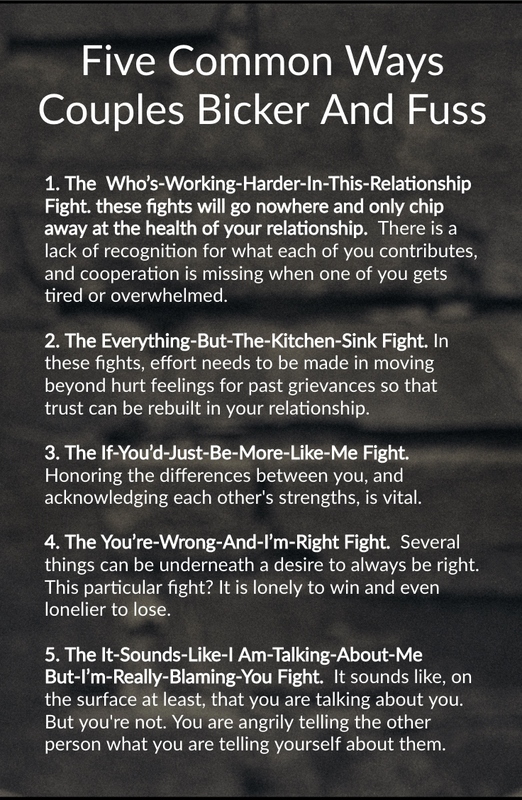 Realize these fights will go nowhere and only chip away at the health of your relationship. Stop focusing on the other person and control your own words. Take responsibility for your own role in the bickering. Recognize you are really arguing about what’s underneath. You are fighting about trust, respect, vulnerability, fear, lack of gratitude, empathy or loneliness. Talk about those things when you are not angry. Risk being vulnerable and express what you’re truly feeling; don’t be afraid to ask for your partner’s help. It can be fun to do an exercise with your partner and swap perspectives; you argue your partner’s viewpoint while they argue yours. This way you both will hear what you sound like when you hear your own words, and perhaps gain a deeper understanding of where they are truly coming from. The good news? I would rather have two people in my office, bickering, than two people who don’t care enough anymore to fight. Your relationship still has passion and intensity, and that can be channeled into healthier directions. If you’d like to learn more about Perfectly Hidden Depression, and if you might experience it, take this questionnaire! This was originally published on October 17, 2015 and was updated on November 9, 2018.